Steve Doyle at Cambridge Yacht Group sends word of a $300,000 price cut on his listing for sale, the 36.6m motor yacht Sovereign. Built by US yard Broward Marine in aluminium, Sovereign was delivered in 1993 and fully refitted in 2008. Accommodation is for 12 guests in six staterooms including an expansive full beam master stateroom on the main deck plus eight crew. Below deck there are three double staterooms with queen size beds plus two twin cabins and all have en suite bathroom facilities. Sovereign has an excellent charter yacht record with a good repeat clientele. Her aft deck offers al fresco dining for nine guests while the sky lounge is a favourite location for guests, with a 52 inch TV screen, games spaces and relaxation areas. She comes complete with an ultra-modern stabilisation system to reduce roll motion effect and ensure ultimate comfort and safety. 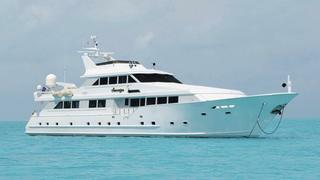 Twin 1,450hp Detroit Diesel engines give Sovereign a cruising speed of 15 knots and a range of 1,675 nautical miles. Lying in Fort Lauderdale, Florida, Sovereign is now down from $1,799,000 to $1,499,000.